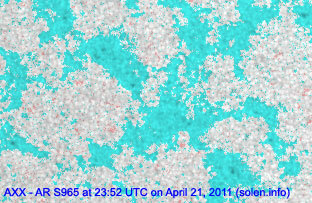 Last major update issued on April 22, 2011 at 05:50 UTC. 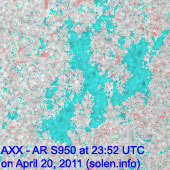 The geomagnetic field was quiet on April 21. Solar wind speed ranged between 407 and 457 km/s. 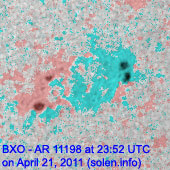 Solar flux measured at 20h UTC on 2.8 GHz was 113.0 (increasing 0.4 over the last solar rotation). 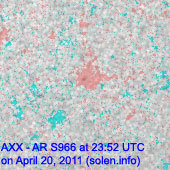 The planetary A index was 5 (STAR Ap - based on the mean of three hour interval ap indices: 4.8). 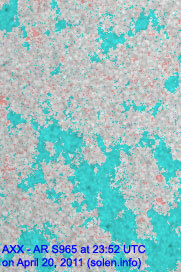 Three hour interval K indices: 12111212 (planetary), 12111222 (Boulder). 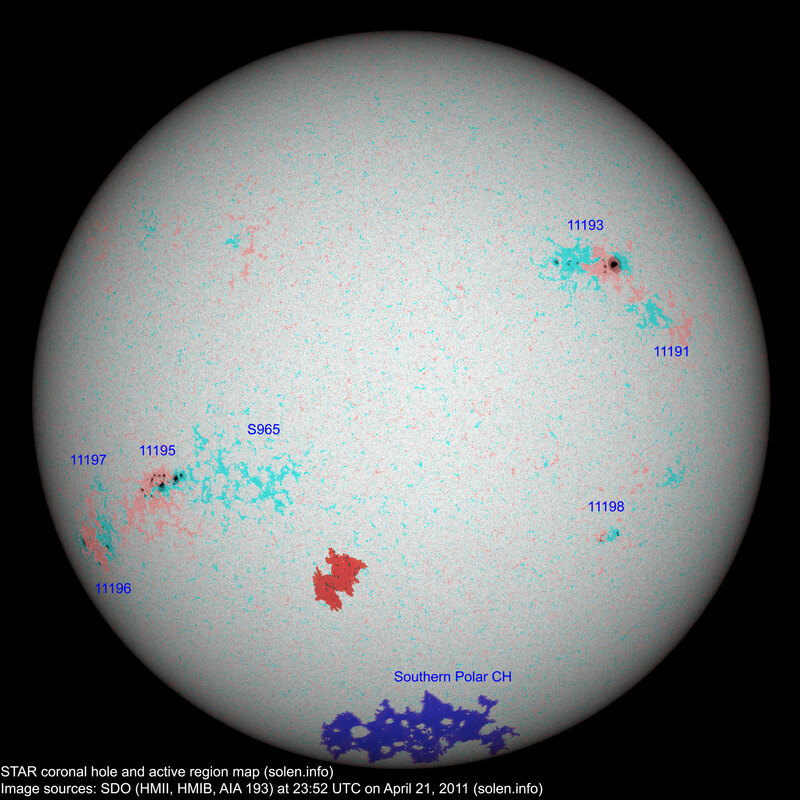 Region 11191 decayed further and could become spotless today. 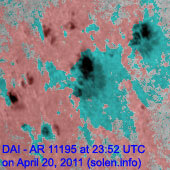 Region 11193 decayed losing spots and penumbral area. Region 11195 developed slowly during the first half of the day, then more quickly during the latter half. 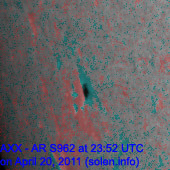 Early on April 22 the region has developed rapidly and could soon become capable of producing a major flare. 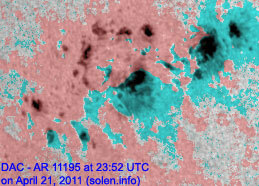 Flares: C1.0 at 08:38, C8.5/1N at 09:48, C4.9 at 14:51 and C4.5 at 22:00 UTC. 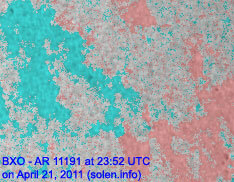 Region 11196 was quiet and stable. 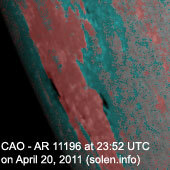 New region 11197 rotated into view at the southeast limb on April 19 and was numbered by NOAA/SWPC two days later. 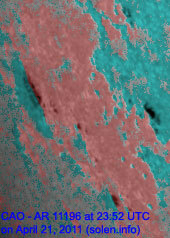 Slow decay was observed on April 21. 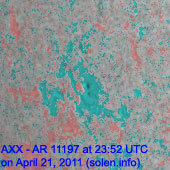 New region 11198 was first observed with spots on April 19, then became spotless on April 20 before reemerging with several spots on April 21. 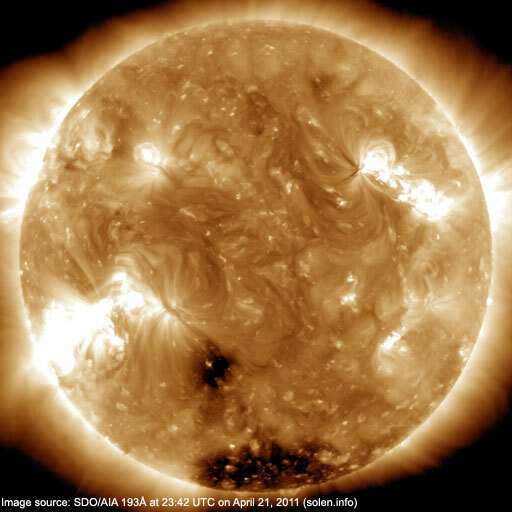 The geomagnetic field is expected to be mostly quiet on April 22-24.